It was the publishers and editors of Latin American newspapers meeting with the Director-General of UNESCO in Puebla, Mexico, on 27 May, 1997, that first called for an International Year for the Culture of Peace. 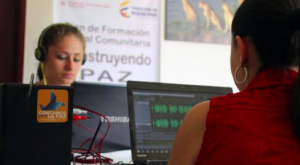 Perhaps, it is in the same tradition that we see more and more in the past few years that the journalists of Latin America, in particular Colombia, Mexico and Ecuador are turning towards a culture of peace. They join their counterparts in Africa to lead the world in this direction. Readers are encouraged to add their comments below.